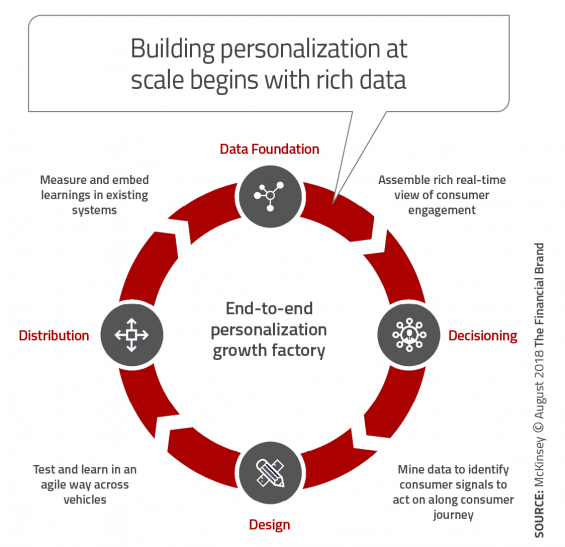 The combination of new marketing technologies and the ability to access and leverage real-time data allows financial marketers the opportunity to create personalization — at scale — for each individual at the right time, and with the right message. Imagine someone is shopping for a new bank or credit union. While they are looking for their new checking account, they are using a comparison tool that helps them determine which account best meets their needs. Ideally, this tool allows them to weigh the new options against the account they currently have, so they can see what’s similar and what’s different. After the new account is opened, the consumer receives a very quick email or text thanking them for their business and helping them understand the best way to start using their account. For financial institutions leveraging the power of today’s marketing technology and consumer data, here is where the fun begins. Maybe the new account holder receives an email with a video illustrating the ease of making mobile deposits using their phone. A few days later, they get an iPhone message encouraging them to use the mobile banking app, with an incentive to link their account to an ApplePay (or GooglePay) mobile wallet. As activity starts to pick up, the consumer receives real-time communications about direct deposit, P2P payments, and an offer for a savings product. All of these communications are not based on a set sequence, but on activities and actions the consumer has undertaken themselves. McKinsey says this can boost total sales by 15% to 20%, and digital sales even more, while significantly improving the ROI on marketing spend across marketing channels. This includes websites and mobile apps right now, and VR headsets and connected cars in the not-too-distant future. Despite recent advances in marketing technology many banks and credit unions are unable to take advantage of real-time data signals that consumers provide as they go about their process of making deposits, payments, and transfers of funds. There is a need to move beyond targeted campaigns and list pulls to personalized interactions. Consumers expect this. 1. Build a 360 degree view of the consumer. Data from across the financial institution must be combined to create a complete consumer profile that is shared across all relevant functions (not just marketing). Machine learning and advanced analytics are used to find similarities between consumers in a very granular manner. This view of the consumer also includes social and third-party data. 2. Base decisions on consumer signals. To determine the best message to send to a specific consumer, advanced analytics are again used to determine a prioritization of messages to be delivered at specific times. The message sequence can change over time based on behavioral cues. More advanced modeling can determine the best channel for communication. 3. Design for consumer journeys. The design of great offers requires cross-functional product and channel teams working together. “Real benefits can only occur when companies shift to ‘war rooms’ of people from relevant functions — marketing, digital, legal, merchandising, and IT/DevOps — who focus on specific consumer segments or journeys,” states McKinsey. 4. Use cross-channel distribution. As the view of the consumer comes together — including targeting and message design — the last step is to build real-time messaging across all addressable channels and to tie these messages to the “martech stack” that can deliver and track experiences. The result is a feedback loop. Bottom line, personalization must go beyond simply putting a name on a message and treating the entire consumer base the same way. Banks and credit unions must design and deliver tailored messages to thousands of consumers in multiple interactions. New technology makes this all possible (and relatively affordable). It is important to make personalization a priority and develop a strategy that works from a strong foundation. 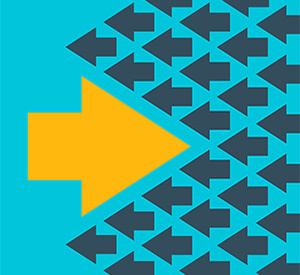 Establishing a personalization strategy doesn’t have to take weeks or months to develop — just a deliberate top-management decision to create a path to more personalized customer experience. Most financial institutions should start making personalization work quickly with what they already have. In other words, launch an initial personalization pilot in days, without striving for perfection. Many times, the biggest barrier to success comes down to focus, scale and commitment. In developing a personalization strategy, many banks and credit unions get bogged down trying to collect and integrate massive amounts of data instead of identifying and collecting the right data. Sometimes less data, that can become actionable fast is better than more data that can’t drive action. Another challenge is that financial institutions have traditionally worked with seasonal ‘programs’ as opposed to immediate triggers. While there are buying patterns for financial products, people purchase on their own schedule. A third barrier to success is to build and work in cross-functional teams that break down existing silo mentality. Cross-functional teams enable a much more agile test-and-learn approach, since all of the experts who deal with the consumer are in the room. This makes the ability to fail and respond much quicker. Finally, the assortment and capability of today’s marketing tools expands continuously, knowing which tools to use (and how to use them) can be daunting. The good news is that there are many firms available to help marketers sort through the maze of options. In fact, the 2018 edition of Scott Brinker’s Marketing Technology Landscape lists ~7,000 marketing-technology solutions. 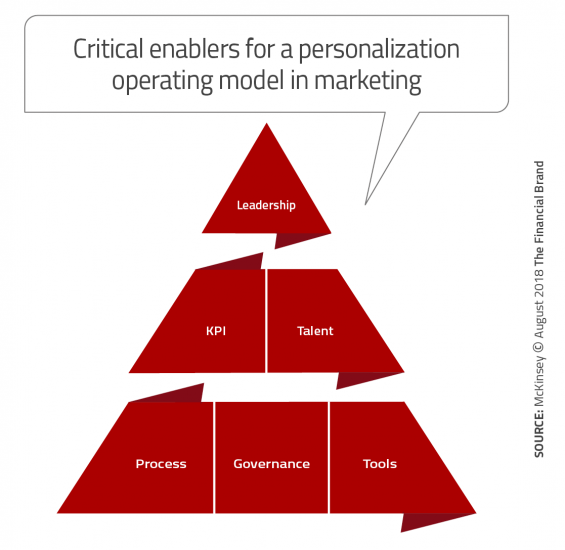 Building a strong personalization operating model requires an investment in six foundational elements: processes, tools and tech, governance, key performance indicators, talent, and leadership. These serve as a foundational pyramid outlined by insight from McKinsey. 1. Process: Commit a full-time cross-functional team to the process of personalization. 2. Governance: Limit boundaries and build communication loops with legacy departments. 3. Tools: Leverage new marketing technology tools that allow for agile decisioning and feedback. 4. Key performance indicators: Focus on small (near term) and large (overarching) successes agreed to by all parties up front. 5. Talent: Find talent on the outside and use the personalization mandate as a springboard for internal promotion. 6. Leadership: Senior leaders need to make personalization not just a company priority but a personal one. “Targeted communications that are relevant and useful can create lasting customer loyalty and drive revenue growth of 10-30%,” says McKinsey. The challenge is to personalize in a way that stays focused and delivers genuine value and relevance. When it comes to personalization, consumers are pretty clear what they want. They want recommendations that they wouldn’t have thought of themselves and a clear direction about what they should buy when they are shopping for a product or service. In other words, financial institutions should show consumers that they have been listening and learning from their activities. People also want their banking providers to know them, look out for them, and reward them no matter what channel they use or what time of the day or night it is. This includes letting them know their overall financial status – on demand. Finally, banks and credit unions must continuously show the value they provide for the insight consumers let them collect, or the “personalization partnership,” as McKinsey calls it, will go away. Building a strong personalized marketing platform at scale is a challenge with tremendous opportunities. Financial institutions that deliver customers timely, relevant, and personalized messages, however, can build lasting loyalty and significant revenue growth.